Lined a 33 x 23cm swiss roll tin with baking parchment. Melted 150g dark chocolate – I used Green & Black’s 72% cook’s chocolate. In a separate bowl, whisked yolks with 175g caster sugar until pale and custard like. Whisked in the melted chocolate. Poured mixture into tin and baked in a pre-heated oven at 180C (gas 4) for 25 mins – cake well risen, lightly browned and spongy to touch. Left to cool slightly then turned out onto a piece of parchment paper dusted with caster sugar and removed backing paper. Left to cool completely whilst made filling. Whipped 200ml double cream until soft peaks formed (again can’t claim all the credit as CT did this bit too). Mixed in 4 heaped tbsp sweetened chestnut puree. Spread this onto cooled sponge. Attempted to roll the whole thing up – here disaster struck! It was quite thick and didn’t seem to want to roll and my impatience didn’t help. I finally managed to cobble something together that vaguely resembled a log shape. What a learning curve. Next time and there will be a next time, I’ll use less sponge mixture and try and take more care when rolling. Despite the original panic induced by the imperfectly rolled log, I actually like the fissures of the finished article which remind me of a pine log with deeply ridged bark. CT managed to hack two chunks off for us to try – his strength must be returning (he even managed to whip the cream and whisk the eggs, so he deserved his extra large slice). The sponge has plenty of body despite being mainly eggs – it almost has a brownie consistency, sweet, moist and dense yet somehow light at the same time. This makes the perfect foil for the cream and chestnut filling, which offsets the sweetness of the sponge and has a contrasting texture and creaminess which creates a divine whole. Oh hell, forget complex analysis, it’s just truly scrumptious. There would be no shame in presenting this chocolate chestnut roulade as a centre piece for a Christmas tea or as pudding for a special dinner. Or like us, no special occasion required. Check out this link for some of my other Christmas recipes. Yum, yum, very pleased to see this addition to your blog. I think the cracks definitely add to its log-like appearance. Choclette, it looks amazing 😀 Very festive and I bet it tastes great too!! This looks delicious. 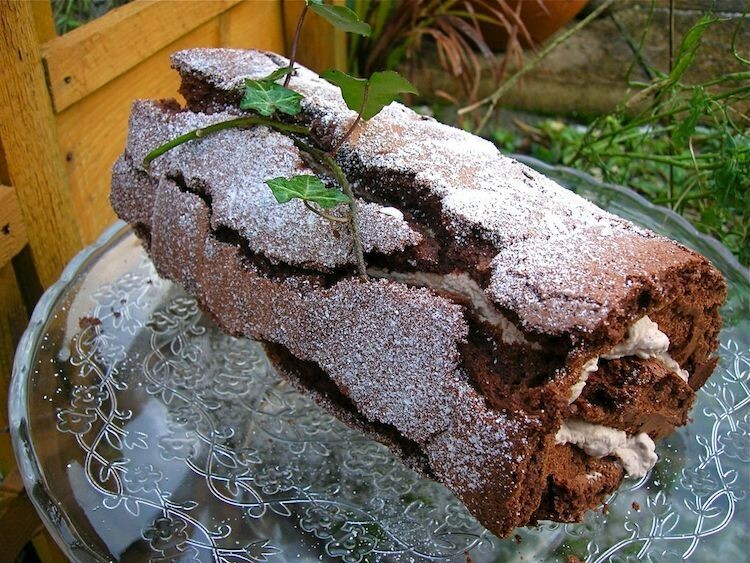 Never mind the cracks – even Delia Smith gets cracks in her chocolate roulade! It sounds gorgeous even if the rollilng was tricky! My mum used to make a divine chocolate chestnut torte, which I suspect is easier to accomplish. Wow – that’s more a trunk than a log! Love the size of it!!! Love the sound of this, chocolate and chestnut puree is such a winning combination. I like the cracked appearance, really looks like a log. Also love that it looks that gorgeous and tasty, and it’s wheat free. I like the sound of brownie consistency sponge. The Hairy Bakers made yule logs on the telly at the weekend – the bigger one’s looked just like yours – it must be the way they are meant to be! This looks very delicious and mouthwatering. It is really a good looking log, edible too. I love the fact you took the picure out in the garden, capturing the winter season too. OOh your so brave. Glad to read that CT is recovering, anything to help him along, even if it an extra slice of Chocolate.